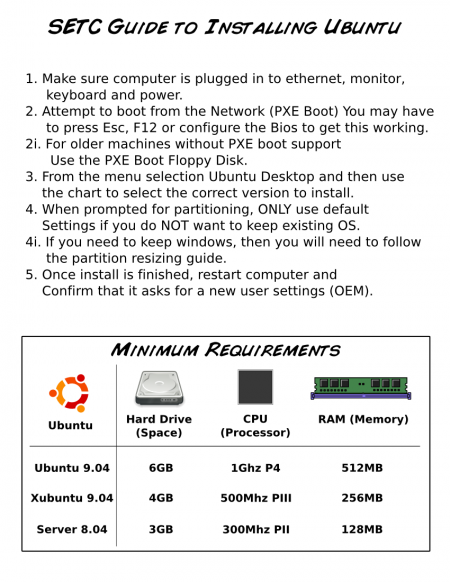 One of the persistent problems we’ve had at the SETC when refurbishing computers is the lack of understanding about the requirements Ubuntu has. There is a certain myth that Ubuntu can be installed on anything and it’ll work just like it does on a 2Ghz Core 2 Duo with 2GB of RAM. So to aid understanding and to give some instructions, I’ve prepared this (very alpha) set of instructions with a set of minimum requirements. Currently showing 9.04, but after testing will be moved over to 9.10 once I’ve confirmed these requirements are accurate for the new version. It’s nice to see the relatively low minimum requirements, especially p3 for xubuntu, but it could stand to be lower, imo.